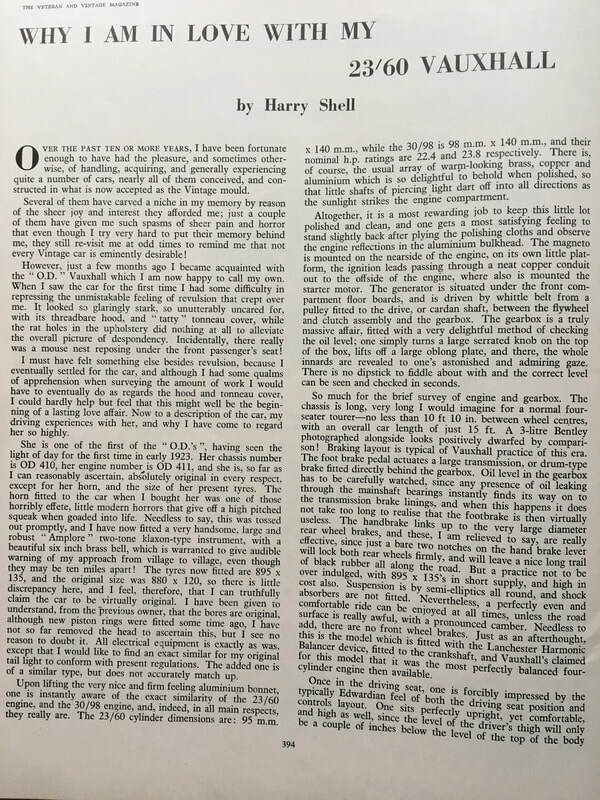 Editor’s Note: I was quite close to Peter Hull at the time that he was writing his monograph on Vauxhall history, when he told me that he had written an article on his interview with Bill Hancock, AJ’s younger brother. For some reason, he did not wish to publish his article, despite my pleading and he remained of that decision up to his death. After Peter’s demise, I respected his decision while his widow lived, but Jennifer Hull died a few months ago, so I feel that I am now released to publish his article – Alisdaire. When the New Zealand Vauxhall agents Scott Morgan & Co. of Christchurch, heard of the fabulous performance of the new 20h.p. Vauxhall in the 2,000 Mile Trial in 1908, naturally they made strong demands on the company for a similar car for publicity in New Zealand. 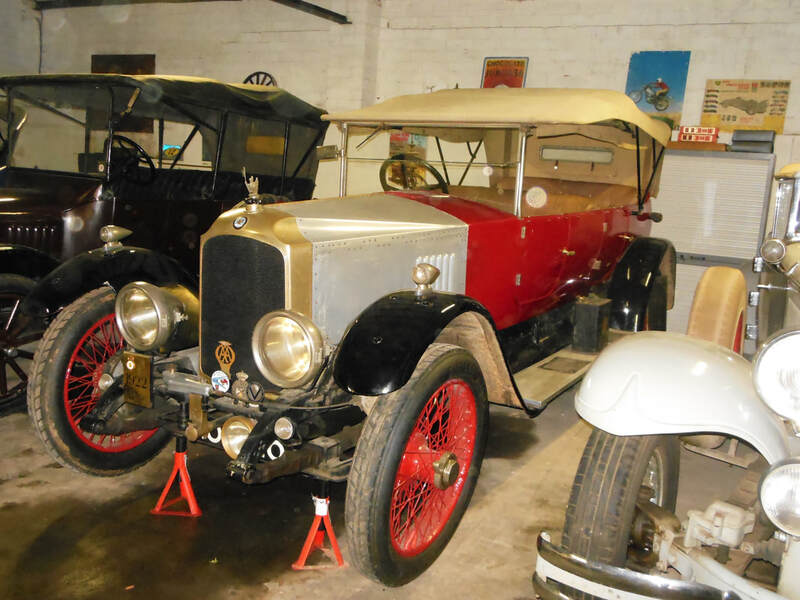 As two cars had been prepared for the Trial, the second 'Y 2' was dispatched from the Vauxhall Works on October 23 1908, and arrived in New Zealand just before Christmas, and in time for Mr. W.J. Scott to compete in the four day trial run by the A.A. Canterbury at Christmas, 1908. 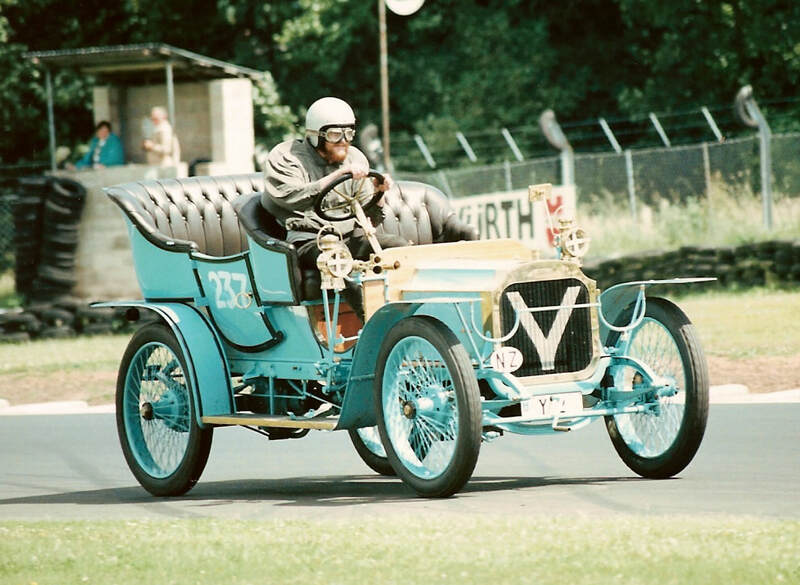 ​In this trial the Vauxhall won a gold medal for a non stop run, and a certificate for highest marks for reliability, (six were awarded), the trophy for the highest marks in the hillclimb on formula, and the trophy for the fastest time in the hillclimb. This was just a sample of the results that were to follow in the next four years when the Vauxhall was never beaten. The car recorded 68 m.p.h. on Brighton Beach in 1912 after Scott's mechanics, on directions from Mr. Hancock works manager of Vauxhalls, had made certain modifications, by which the engine then produced about 3,000 r.p.m. In 1913 in the Kaikoura trial it averaged 44 ton miles per gallon or 28.9m.p.g. for the 250 miles. This was a two day trial of very rough going and many river crossings. The 'Old Blue' as the car was affectionately known in later years, arrived in Christchurch fitted with a four seater touring body of the Roi des Belges type, and wooden wheels. Sometime during the next few years the firm (it was now called W.B. Scott & Co.! built a light four-seater shell for hillclimbs, and the original body, was retained for other events. During this period as a trials car, various modifications were made and at times special equipment for special events was fitted to the car. The efficiency of the engine was improved by lightening the steel pistons by cutting holes and vents, fitting larger valves and springs, a twin ignition system was fitted - the first one made by Scotts, and later a Bosch twin ignition magneto was fitted, steel tappets replaced the original phosphor bronze, and so on. A special economy camshaft was used for petrol consumption tests. (the first made by one of the mechanics, ground by hand and hand faced) and a special arrangement for 'extra air' metered by a very long hand lever which allowed extremely critical adjustments. For river crossings a special roller blind was fitted in front of the radiator, a leather cover was added round the brass cone clutch to prevent slipping, the carburettor was placed up high, level with the dash etc. About 1913 the steering geometry of the car was altered, previously cornering had been very tricky - the steering wheel locking and the engine had to be let off to straighten the wheels. Once, after months of work, when the car was out on its first trial run, the back axle drive shaft snapped. Vauxhall Motors sent out a new camshaft (a special one) and a stronger crankshaft after the first one was twisted during tests after 'souping up'. Thus the car was equipped for trials etc., and was so used until the end of 1913. "Old Blue" in 1951, when collected from Mr. Ron Dunlop. It was also used extensively for demonstrating the capabilities of the Vauxhall, and many a prospective customer was taken for a short burst along Barrington Street and up Hackthorne Road. One sale that didn't evenuate was the prospective buyer taken to Barry's Bay for a run. They had seven punctures and so no sale, but hardly the fault of the car. Again, while at Barry's Bay for practice climbs, the car got mixed up with a horse and cart and Mr. Scott had to stop hurriedly. As the car skidded across the road and the back swung round so that the front wheels finished over the edge, the passenger, Mr. L.B. Scott (brother to W.J.) jumped out and caught the horse! The firm had a standing challenge to match 'Y2' with any car irrespective of horsepower. Many threatened, but an actual challenge never took place. Probably the nearest to it was in April 1913 with an 80 h.p. National racing car owned by Allen Doone, who was touring with a theatrical company. Scotts accepted the challenge, and Brighton Beach was proposed for the contest, but Doone eventually backed out by saying that he was only prepared to have a go on the Wellington-Hutt Road, knowing full well, that this was strictly illegal and that Scotts would not be prepared to take the risk when miles of open beach were available close at hand. Actually the firm did apply for permission to use the Hutt Road, but this was not granted, so no race took place. In a Fielding pub the boastful owner of a 40h.p. Wolseley (slightly under the weather) was heard to say that he would take on anyone in town - eventually in New Zealand - even the Blue Vauxhall! Mr. Scott, whose ears pricked up at this, said he'd have a go, and handed pen and paper to the Wolseley owner to put his terms in writing. This sobered the Wolseley owner up a bit, especially when told the car was a Vauxhall. "Of course it wouldn't by any chance be a Blue Vauxhall?" - No wager took place. 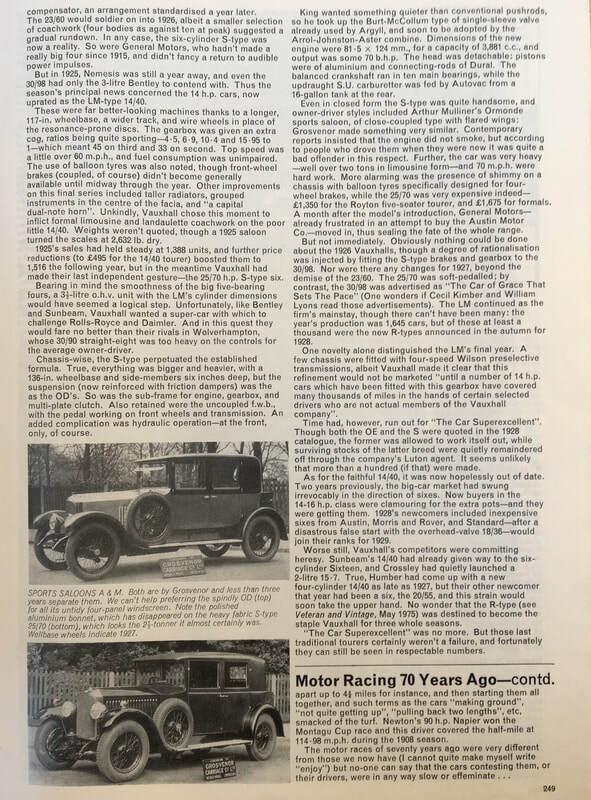 In 1913 the car was sold to Dr. H.J. Simpson, of Darfield, after Scott's Coupe de l' Auto Prince Henry Vauxhall had arrived. The third body was then built by H. Kennedy of Worcester Street, Christchurch, on the style of the 'Prince Henry' with V'ed flutes, long rakish bonnet and scuttle leading up to a small V' ed windscreen. Finished in maroon and cream it was a very smart looking car. Kennedys had left shavings in the sump, the car lost oil pressure on the way to Darfield and the piston barrels were scored. We understand that Dr. Simpson never really used the car. The Vauxhall next appears about 1918-19 when purchased from Archibald's Garage, Christchurch, by Mr. S.A. Webber, of Rangiora, when his son returned from overseas with the N.Z. forces. The son, Mr. R.J.M. Webber, drove the car until the end of 1925. 4.12.25 transferred to Horrell Bros., a local garage, and 23.9.26 purchased by Mr. Ron Dunlop, also of Rangiora, who drove it until about 1930, when the car was left in the shed from which it was rescued in 1951. During the intervening years, the radiator was given to a friend for a sawbench - it finished being buried for a wireless earth, and then supposedly was given for scrap during the last war. (Our beautiful brass radiator!). The front springs went for a trailer set; one of the big Rushmore headlamps went to Picton for a fishing launch which subsequently sank; and the pistons gradually rusted to the block jthey eventually had to be jacked apart) while the shed slowly subsided round 'Old Blue'. The third body built 1913-14 by H. Kennedy, Christchurch for Dr. H.]. Simpson. 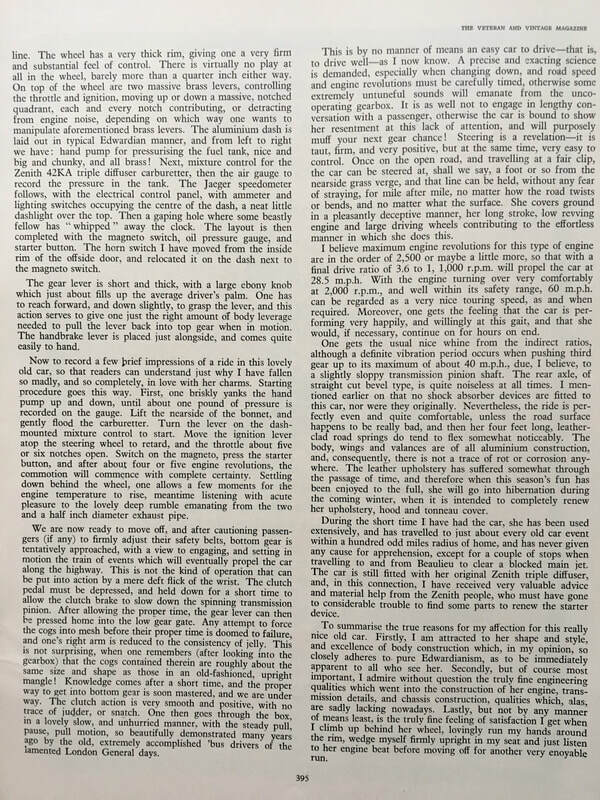 In 1950 a group were scouting throughout the district for cars to use in the Centennial Procession at Rangiora and one day Keith Palmer came to Jack and said that he had heard of a car, but on viewing it they decided it was too far gone to use, and their energies were extended on others in better condition. However having joined the V.C.C. 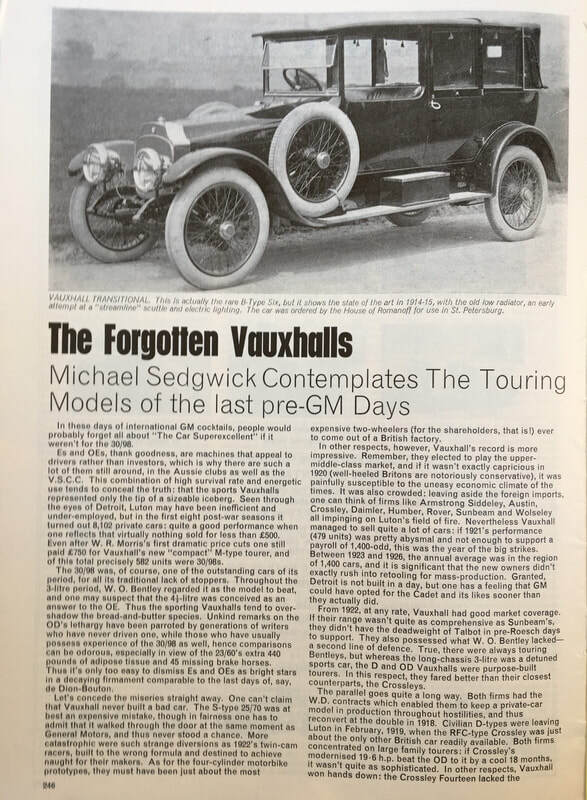 after the Christchurch Centennial Procession in which he drove the 1911 Wolseley- Siddeley, Jack recalled the old Vauxhall and collected it from Dunlop's sometime in 1951, and immediately garaged it. Although restoration progress was slow and intermittent, and delayed by the restoration of the 30-98 Vauxhall it was soon realised that the car was something special. After checking with Mr. W.J. Scott we presumed that the unusual engine number Y2 55487 and several other unusual features on the car indicated that it could be one of the 1908 Trial cars. 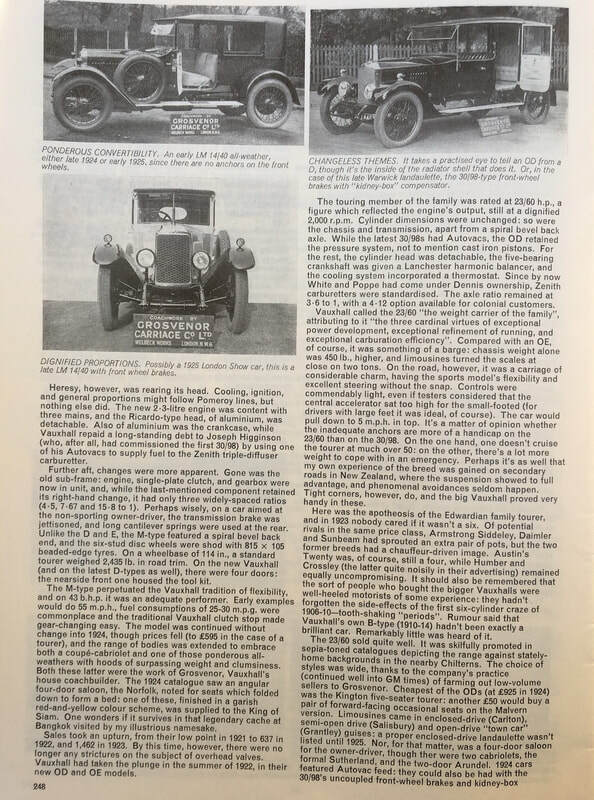 By the time these articles were first published it was definitely confirmed by Vauxhall records held by the Veteran Car Club of Great Britain that indeed it was the reserve car for the 1908 2,000 Mile Trial, built to the design of Laurence H. Pomeroy. 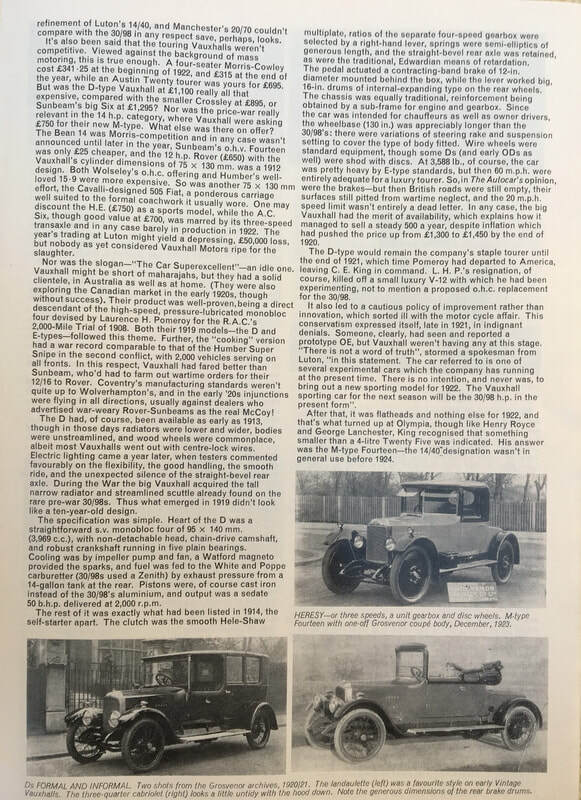 The history of the car has been slowly built up by letter writing, searching through old papers for trial results, by interviewing many people and a collection of photographs. The third body, car outside W.B. Scott & Co., Christchurch. All this was to help in the rebuild, especially to ensure the body lines were correct. Finally after a hectic finish we were on the road heading for the start of the Commemoration Tour in February 1985. Although once more off the road, we hope that it will not be too long before 'Old Blue' is again thundering along the roads. Special thanks were given to Mr. W . J . Scott in the original article for providing much of the material in this section. For 1908 the Canterbury Auto- mobile Association staged prob- ably its biggest trial ever. Among the thirty-seven entries were a number of cars from the North Island, including a White steam car of Hawkins & Rowe, Napier, which was considered ineligible and relegated to carry officials and reporters on the trial. Entries ranged from the 50h.p. Darracq from Timaru, down to a bevy of 8h.p. Reos and Rovers. Names that are almost forgotten like S.C.A. T., Argyll, Stuart and Belsize mingled with the more familiar Vauxhall, Talbot, Wols- eley and Cadillac; in all there were ;seventeen 'lfuakes repre- sented. The trial -covered 547 miles during the four days of.the event. Official observers were of course, carried on all cars and these were changed daily. Points were lost for all unofficial stops (apart from stops for tyres). As with most of these early trials, the object was to test the relative reliability of the various touring cars. Each day a specified time was set for the run, which cut out 'excessive speeding' and at the same time allowed the smaller cars to compete. There were no classes - trade and pri- vate owners were all in together - and a formula arrangement was used to allow for the various engines and sizes. Scott Morgan & Co. had entered their new 20h.p. Vauxhall (Y.2.! which had arrived from England only a week or so before the event, and this was to be driven by Mr Walter Scott. Because of the late arrival the car was run just as it came out from the factory - Mr W.B. Scott (father of the driver!) would not allow any experimenting at that stage. As the dark horse of the event and with a reputation preceding it, no doubt the new Vauxhall was watched with great interest especially by the rival firms. December 28 saw the thirty- seven cars lined up in Worcester Street, east of the Cathedral, and the first car was flagged away at 8am, the remainder following at one minute intervals. Entry No. 12 (the new Vauxhall) was away at 8.26am. The route was from Christchurch up the Main North Road to Leithfield, then inland back through Sefton, Oxford to Springfield for lunch - one hour allowed for this - and then back to Christchurch on the Main West Road. The time set for 119 miles was 5 - 51/2 hours. Much of the inland section of this route was on back roads, which have only been sealed in recent years. 1908 Trial Day 3 at the lunch stop Waiau Ferry near Hanmer. Photo courtesy Rangiora Early Records Society. The following day there were only 35 starters, one of the 16/20 Reos and the Sizaire Naudin pulled out, and during the day the 50h.p. Darracq and a 16/20 Argyll withdrew with engine troubles. Generally engine and tyre troubles were more numerous. The route was from Christchurch to Darfield, then through the Rakaia Gorge to Methven for lunch, on to Ashburton and back to Christchurch on the Main South Road, 149 miles. The petrol consumption test (held this sec- ond day' was made more difficult by stong nor' west conditions. Knowing how it can blow in the back country round the Rakaia Gorge, one can imagine the cars battling for miles against the strong head wind. Added to this were the hazards of the water races between Mayfield and Ashburton - "water races were big, could have floated boats". The third day with 32 starters, was by contrast less eventful, even the Waipara River, usually notorious (the A.A. used to keep a horse there as the crossing was so soft), was particularly low, so the smaller cars had better runs, and there were no withdrawals during the day. The route was north up the main road to Culverden and then to the Upper Waiau Ferry (near Hanmerl for lunch and the same way home, 166 miles. On the final day the 25/35 Ariel was a non-starter and the remain- ing 31 set off on a pretty gruelling trip. During the day a further four cars withdrew. 435 miles had already been covered and today as well as the hilly route, there was a timed hill climb. The course led out to Little River and on to Akaroa. Because this road was very narrow and it was only possible to pass in a few places, lunch was a rather prolonged affair as the entrants had to wait until the coaches from Little River had arrived before beginning the return trip. This was on the same route as far as Little River - including the hill climb at Barry's Bay - then up Gebbies Valley, Governors Bay and on to Christchurch, 113 miles. It had rained heavily in the early morning and roads were muddy and sticky until Little River, but dried later in the day. On the way to Akaroa, the spring controlling the advance and retard position of the magneto on the Vauxhall became unhitch- ed - leaving it fully advanced all the time. 'Y.2.' was the first into Akaroa, and after the car had been directed into a quiet street by one of the officials, M. Malaquin who was the observer said, "Now if anything wants fixing, I'm going off for a while!" (He had previously admitted to being scared at riding in the Vauxhall for the hillclimb and wanted everything in order.! Of course Mr Scott didn't touch a thing - not wanting to lose five marks! Back at Barry's Bay the cars were lined up outside the Post Office and sent off up the hill at three minute intervals - no closed roads of course. The climb was 1,600ft in five miles of bends and sharp curves and although the road had dried it was still heavy, but the run up was fast and exciting. The Vauxhall's time for the hill was 9min. 22sec., fastest time of the day. Second was the 25h.p. Talbot taking 12min. Ilsec., with about 10cwt. more up. In spite of the talbot's extra weight the Vauxhall's time was fast enough to collect first place on formula also. The trip was not yet over however, and the climb up from Govenors Bay over Dyers Pass was still ahead. The last corner was so tight that many cars had to have two goes to get round. By taking it close to the bank, the Vauxhall roared up, no doubt giving M. Malaquin one more fright for the day. Here also passengers were shed from many cars - Scott Morgan & Co.'s Gladiator for one couldn't get up with a full load. Then finally, for 'Y.2.' home at 7.17pm. Of the thirty-seven entries, twenty-seven completed the trial and only six had non-stop runs for the whole event. The overall winner, taking into account petrol consumption and hill climb was the 15h.p. Talbot of Adams Ltd. driven by H. T. Adams. Gold medals were awarded to the six cars making non-stop runs; - A. Morten's 30 h.p. Wolseley- Siddeley; Adams Ltd. 15 h.p. Talbot; Adams Ltd. 25 h.p. Talbot; I.H. Williams' 22 h.p. S.C.A.T. ; Scott Morgan & Co.'s 20 h.p. Vauxhall; W.M'A. Duncan's 12/14 Singer. These six cars were also presented with certificates of reliability each having 1,000 marks - no points lost for reli- ability on the trial. The Trophy for fastest time in the hill climb, and the Trophy for first place on formula in the hill climb were both awared to Scott Morgan & Co.'s Vauxhall - 'Y.2.'. It is interesting to note that the entry fees for the trial amounted to £165, from which the C.A.A. made a nett profit of £13-18-1! The next competitive appear- ance of 'Y.2.' was May 21 1910, when petrol consumption and speed tests were held at Addington Metropolitan Track, Christchurch. By this time extensive experimenting had been done on the Vauxhall in regard to fuel consumption and the special "extra air" system had been fitted. For the fuel test, carburettors were connected to an improvised tank holding half a gallon of petrol, fitted to a lamp bracket. Cars ran until the fuel gave out. The speed test was made immediately after this and no adjustment to the motor was allowed. This was a half mile standing start on the circular track, and considering it consisted of three inches of dust well watered, the speeds were surprisingly good. Entries of which there were twenty-three, were divided into three classes on h.p. rating. Some of the less well known cars included a 7.3 h.p. Chenard Walcker, 16 h.p. Marl- borough, and 25 h.p. Chalmers Detroit. Petrol consumption Class C 20h.p. and under 30h.p. 1. W.J. Scott's 20h.p. Vauxhall (Y.2.) 100 points, 34.44 m.p.g., and 43.18 ton m.p.g. 2. F.W. Johnston's 12/16 Talbot, 94.3 points, 27.77 m.p.g. 38.72 ton m.p.g. 1. Scott's Vauxhall, 48 sec. 2. 2. Dexter & Crozier's 30h.p. Cadillac, 51 sec. The first Hackthorne Road Hill Climb was held on June 11 1910. The climb ran from the foot of Hackthorne Road up to the junction with Dyers Pass Road, and included some fairly steep grades and very acute corners. On the day the road was in excellent condition. Only twelve of the nineteen cars entered, competed and the contest was mainly fought out between the Vauxhalls and the Talbots. A striped two seater 20 h.p. Talbot was picked to win the event. Results for the first time were divided into Open or Trade Class, and Private Owners Class. Trade: 1. W.J. Scott's 20 h.p. Vauxhall (Y.2.) 1 min. 49 sec. First on formula and fastest time of the day. 2. On formula Adams 15h.p. Talbot. This day Mr Scott drove both Vauxhalls entered by W.B. Scott and Co. as the firm had by now been renamed. The next major trial was the 1910 trial to Dunedin and back, but 'Y .2.' was not entered for this. Instead Mr Scott drove one of the new 'A Type' Vauxhalls which received a silver medal for second place in Open Class and first prize for petrol consumption. Before the next hill climb on Hackthorne Road on March 11, 1911 the lignt touring body had been built and fitted to 'Old Blue'. The course was the same as the previous year and there were thirteen competitors. 'Y.2.' went up at approximately 40 m.p.h. to clip 15.2 sec off last year's time. the four Vauxhalls entered, two by W.B. Scott & Co. and two privately owned, scooped the pool. Open: Gold medal, fastest time W.J. Scott's Vauxhaillmin 33 4/5 sec. Gold medal, first on formula, second fastest time W.B. Scott's Vauxhall. Imin 48 3/5 sec. Second formula and second fastest time A. Goodwin's Vauxhall. Probably the first real speed trials ever held in New Zealand were on New Brighton Beach on March 9 1912. The five mile straight of sand ran from near the mouth of the Waimakariri River to a mile north of the New Brighton pier. These beach races were handicap events, begun from a standing start and although a time was chosen when the tide was out/ leaving a wide expanse of firm sandt there were usually a few hazards such as heaps of seaweed, odd patches of really wet sand and sometimes even pools of water. However this day conditions were fairly good. Both W.B. Scott & Cots entries were stripped to the chassis and no doubt much work had been done in tuning up tOld Blue. 1. W.J. Scott's Vauxhall, off 15sec. 4 min, 50 sec. 2. W.B. Scott's Regal, off 30 sec. 6 min, 6 sec. 3. J.C Mercer's 12 h.p. Sizaire Naudin, off 75 sec. 6 min. 25 sec. Two cars were scratched and only two competitors entered in the Private Owners Class. F . W . johnston's 25 h.p. Buick was first, off 50 sec at 6 min. It was nearly 4 p.m. when the first cars got away as the field telephone was a long time being installed. The average speed of the Vauxhall was 62 m.p.h. and the peak reached was 68 m.p.h. By March 15 'Y.2.' was completely overhauled and re- equipped with the light tourer body for the Hanmer Springs trial of March 15 and 16. Twenty four cars started off on the 141 miles for the first day, with the route digressing through Oxford before returning to the main road at Amberley. A maximum of 71fz hours was allowed. This was the first time that Minervas were entered, four vehicles taking part, and Mr T. Withers of Wellington, with an Itala, arrived too late to start. "Mr W.J. Scott's 20 h.p. Vauxhall, a rakish looking four seater torpedo bodied car, not finished for selling purposes", is how the papers described 'Old Blue' on that occasion. The overnight stop was at Hanmer Springs. Brighton Beach March 1912 Scott's Regal and Vauxhall stripped for action. The second day covered 162 miles returning through Scar gill to Domett, and back on the Main Road, with a maximum time of 8Vz hours. The Greta Cuttings caused a few stops and a Unic taxicab had to shed its passengers at one stage. A strong wind was blowing and delays were caused by mobs of sheep, but the roads on the whole were good. There were ten entries in the Trade Class, four of which withdrew during the course of the trial, whereas all fourteen Private Owner entries managed to complete the course. Results Trade Class: First prize reliability, Gold Medal, certificate for non-stop run, First Prize petrol consumption 35.13 m.p.g. 48.3 ton m.p.g. W.} Scott's 20 h.p. Vauxhall. Second Prize reliability, Silver Medal, certificate non-stop run, Adams Ltd. 16 h.p. Minerva. N.G. Gilchrist's Minerva was first and also won first prize for petrol consumption with 47.16 ton m.p.g. It is interesting to note that this is the first trial in which petrol consumption of the Private Owners is comparable to Trade Entires and that nine non-stop runs were made, whereas only two Trade entries had such. On December 14 1912, another Brighton Beach Race was held and this was the first appearance of the' 20 h.p. Coupe de l' Auto 'Prince Henry' Vauxhall recently acquired by Scott's. 'Y.2.' was of course not entered. The following March was not only the last trial for 'Old Blue' but also probably the toughest. This was the well remembered Kaikoura Trial of 1913. For this the original Roi des Belges body was used and a great deal of preparation was involved before the trial took place. In view of the numerous river crossings special preparations to waterproof the before the event to glean as much information on fords etc. as possible, but this was of little use, in the end, as a terrific storm altered the whole situation some days before-the start. The actual route is worth describing in some detail and quotes are from local newspapers reporting the trial. "The extremely rough nature of the riverbeds can hardly be realized by those who have not been over the road. It is not a case of merely crossing fords. The riverbeds for miles are the only roads, winding tortuously through hills on both sides, and the track shifts quickly as fresh water comes down. Wheel ruts are the only guides to the road. Every now and again a soft bottom is struck, and the driving wheels slip ominously with a momentary threat of spinning round and ploughing a trench in which to lie inert. The streams proper had steep sides and had to be approached gingerly on the low gear. The cutting and turns in the roads were in themselves a severe trial for any driver climbing up hill. The cars had to be swung around turns quickly enough to avoid a dead stoppage. . . . . . A really hard test far more trying than routes in use in the 'Old Country'." The first day on the inland route to Kaikoura covered 130 miles. The road was fairly good until nearing Culverden when it be- came loose and dusty and new shingle was met before reaching Waiau, where lunch was held. From here on the last fiftyfour miles were a real test. "At 99 miles the Conway was approached by a very steep downgrade of 1 in 5 which severely tested the brakes. The riverbed had to be traversed a long way and was soft in places." Then on to another soft bottomed crossing, the long descent into the Greenhills with 33 bends cul- minating in a nasty creek at the bottom, Greenburn River, the Kauhautara - rough with a fair volume of water, Crib Creek, lastly the Kowhai River and then a final five miles into Kaikoura. Fortunately the rivers were low and the main traffic difficulty was the mobs of sheep leaving Culverden after the Amuri Sheep Fair. One large flock of 1500, about twenty miles from Kaikoura, caused a real blockage. The Northbound coach, whose driver persisted in remaining in the middle of the road for a considerable distance, prevented cars passing. The return the following day was made down the coast with numerous river crossings all fairly deep, first the Kowhai, then Kauhautara which was about 18ins. deep with a bad entrance and exit, over the Hundalee Saddle and on to the Conway which involved three soft crossings with a seven mile traverse of riverbed. (This was well upstream of the present road bridge). After this the route was comparatively straightforward back through Cheviot, a detour round through Oxford and on to Christchurch - 120 miles. All stops except compulsory ones, e.g. lunch etc. and those for tyre troubles, caused loss of marks. Cars were given one minute in which to get started after the word 'Go', and as an innovation observers were changed twice daily. It was the usual last minute rush to complete the work on 'Old Blue', and the car was worked on until 5 a.m. the day of the trial, when Mr Scott went home for a cleanup, and then straight back to be ready for the start at 7 a.m.
(To be continued) March 1912 Hanmer Trial 'Old Blue' with second body W.J. Scott at the wheel. developed a slipping clutch was disqualified because the passenger was driving. Eleven cars arrived at Kaikoura with non stop runs after the 130 miles and all were impounded for the night. Kaikoura Trial 1913 In the Con- way. Note roller blind on radiator & ropes on rear wheels. Photo Newell Collection. Demanding Scott's disqualification immediately. However the judges considered that as he was enterprising enough to have thought of the idea he should be allowed to continue, but set his starting position back from third to twelfth place. This upset all the plans to reach the fords first. Most of these fords were bad at anytime but after a procession of cars churning up the bottom they were terrible. The general idea of many of the competitors was to follow Mr Scott as they imagined he would know the best route - actually, the mechanic hadn't been of much help to him. Old Blue barely visible in the ford on the Conway River. Ph Newell Collection. was off as the clutch gripped once more. Horses were available here to tow cars out with consequent loss of ten marks and many had to make use of them. The second ford was rather ticklish as the exit was soft, and by the time the third Conway ford was reached the ropes on 'Y.2.' were flapping after several miles of riverbed. While they stopped to remove this encumbrance the of- ficial Siddeley-Deasy (yes again), Piper's Cadillac, and Morten's Wolseley went into the ford only to get stuck. Mr Scott went upstream where the river was wider and fairly shallow and had no difficulty. Those cars following in the same place also had no trouble. The main problems were now over and it was a matter of settling down to save on petrol, especially in view of the amount consumed by the Vauxhall in get- ting through the Hundalee first. As cars were allowed five hours from Cheviot to Christchurch, 'Old Blue's' speed for the rest of the trip was about 18-20 mph. In the Gretas a rear tyre blew out, and this involved using a new tube and then battling for a con- siderable time to get the outsize cover back on, the engine running all the while. The final stretch along Papanui into Christchurch was for Mr Scott probably more nerve wracking than any other trial, because he was fairly sure that the trial was his providing the car kept going, and he had visions of the evening traffic - bicycles, horses and carts, etc - and that something might cause an in- voluntary stop. At 6.10 pm - the last car - the Vauxhall arrived at the drill sheds where there was a big crowd waiting to see how much petrol the car had used. Fourteen cars completed the trial and only three, the Vauxhall, the Panhard et Lavassor, and a Cadillac finished with non-stop runs. mpg. 2.M. Stevenson's Panhard et Levassor. 1,000 marks Silver Medal, certificate for nonstop run. Second petrol consumption 23.18 mpg. 38.83 ton mpg. 3. Kib- blewhite's Hupmobile. 970 marks Bronze Medal. Car stopped in two riverbeds and to adjust speedo. Private Owners Class. 1. Hubbard's Cadillac, 1,000 marks Gold Medal and certificate non stop run. First prize for petrol consumption went to R.O. Dixon's Minerva with 31.35 ton mpg. The final event in which 'Old Blue' took part at this time was the O'Kains Bay hillclimb on Oc- tober 27, 1913, and this was the only time that Y.2. and the 'Prince Henry' both took part. The hill was a long severe one out of the Bay (on Banks Peninsula! and the course of four miles was in good condition. The first mile was an undulating stretch at which some speed could be gained although there were some tricky bends, after this the climb began in earnest and pinches of 1 in 4 mixed with hairpin bends made quite an exciting course. "There is little doubt that the star climbs of the day were done by Mr W Scott in the Prince Henry Vauxhall. The flat was taken at racing speed and the curving course tackled in masterly fashion. The Vauxhall touring car (Old Blue! driven by Mr Marsh and with a heavy weight up also performed in an exceedingly creditable fa~hion." There were eleven entries but two cars were non starters. Old Blue had been deliberately weighted to gain a better result on formula and the new Coupe de I' Auto Prince Henry was aiming for the fastest time. This was the only event in which Mr Scott did not drive Old Blue. Marsh was one of Scott's mechanics and had worked regularly on the car. Trophy and first prize on formula: Vauxhall Touring car driver J. Marsh, 8 min. 55 2/5 secs. Fastest time: Prince Henry Vauxhall driver W.J. Scott, 7 min. 27 secs. 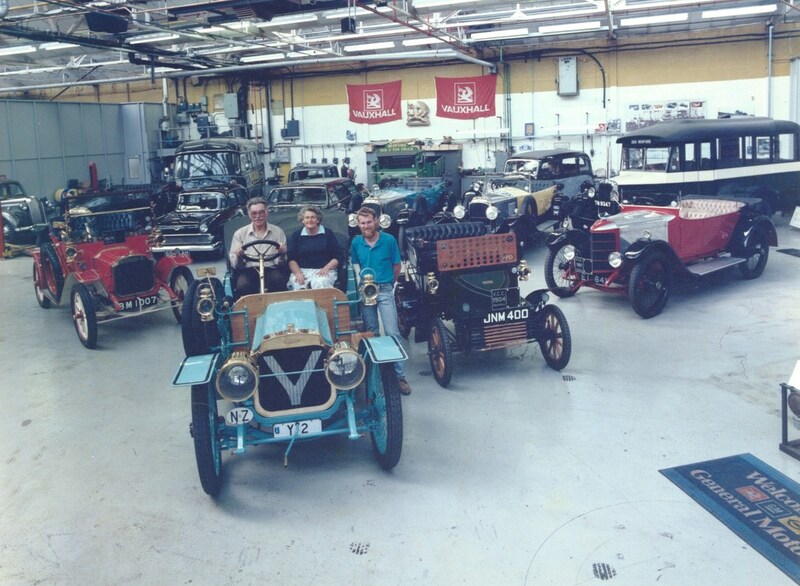 Thus finished on a high note, five years participation in competitive events, in which 'Old Blue' had not only brought the name Vauxhall to the forefront of N .Z. motoring but had already become rather a legend throughout the country. Special acknowledgement was made to Mr W.J. Scott for much of the material in the last three parts of the Vauxhall story, when first published. The information coming from a number of interviews with him.